The magical world of Azeroth is being torn apart by a bloody, devastating war. The Orc hordes are on the rampage once more, tryhing to reclaim their lost glory. The Human Alliance has gathered to face the Orc Menace, but is being troubled by mysterious plagues and death cults. Driven by the terrible Lich King, the Undead Scourge is spreading Plague across the land and swelling its ranks with the corpses of the fallen. The mysterious Night Elves, protectors of the forest, fight to defend their home against those who would defile it. The award-winning Warcraft(R) computer game explodes off the computer screen and onto your game table! 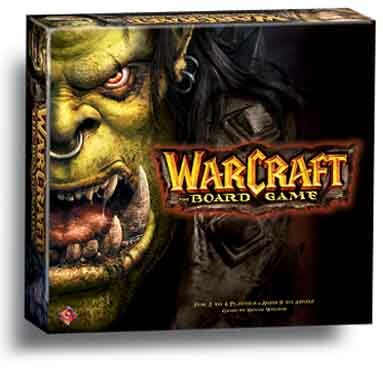 In Warcraft: The Board Game, you take control of one of the four mighty races and charge into battle for control of Azeroth. To win, you must manage your resources wisely so you can train and upgrade your troops while fighting furiously against your opponents. In a time of chaos, do you have what it takes to survive? Other products in the "Warcraft" series.